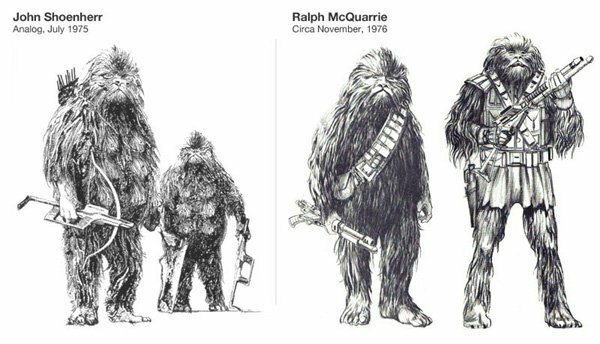 The original trilogy of Star Wars films feature some of the most iconic extra terrestrial designs ever brought to the medium, but perhaps the most iconic among them is the character known as Chewbacca. Brought to life by 7'3" British actor Peter Mayhew, the Wookie's furry appearance and trademark growl is a part of Hollywood history, and his legacy will only further continue thanks to the upcoming new trilogy being kicked off with Star Wars: Episode VII next year. Fans may think that they know absolutely everything about Chewie at this point, but the reality is that an interesting tidbit about his ancestry has only recently been unearthed: did you know that Chewbacca's famous look may have been directly inspired by one of the earliest works by author George R.R. Martin? What you see on the left is a drawing done by John Shoenherr in July 1975 for George R.R. Martin’s short story ‘And Seven Times Never Kill Man!‘ The legend goes that this was one of the drawings George Lucas delivered to artist Ralph McQuarrie when trying to inspire a look for Chewbacca - though Lucas was apparently under the impression that the illustration was from some 1930s sci-fi project. 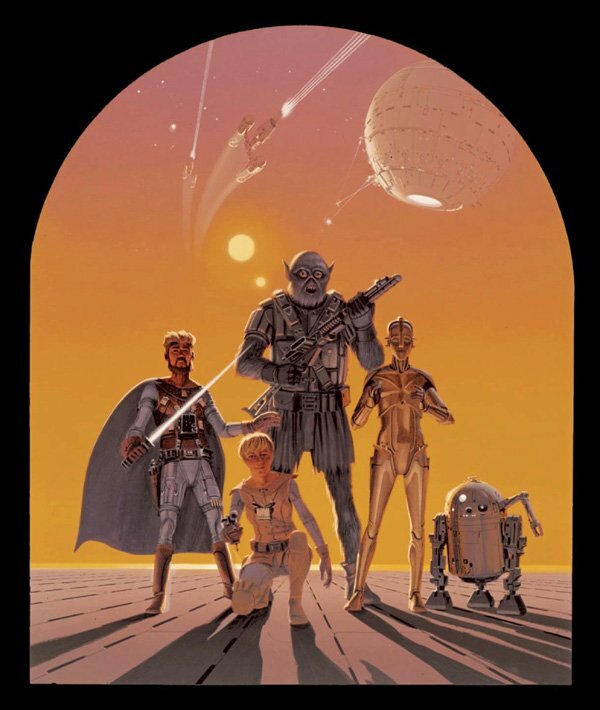 The drawing on the right, of course, is one done by McQuarrie in 1976 - a year before the first Star Wars - and the figures are pretty shockingly similar to what Shoenherr came up with. Between the two pencilings you can see some of the major details that found their way into the finished film, including the bandolier and crossbow (or, rather, bowcaster). I understand that many of you are probably thinking, "Oh my god! Chewbacca's look was stolen!" but the reality isn't as black and white as that. Any artist will say that inspiration is a huge part of the creative process, and while the works are similar, it's pretty clear that the design eventually evolved and changed beyond it (with other artists surely contributing). All that on the table, what do you think about this new unearthed bit of trivia? Hit the comments to tell us what you think.